L'Occitane is a unique brand that caters to the well being of women and men alike. It seeks to create harmony; linking the pleasure of the senses with inner balance. 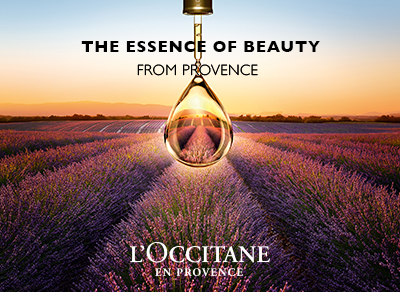 L'Occitane's range of luxurious beauty products are manufactured in traditional ways using the finest natural ingredients, primarily from Provence, in southern France. They seek to create a harmony in you that balances sensual pleasure with inner well-being. Products in the L'Occitane range include natural skincare, body care and fragrances for men, women and the home. Founded in 1976 by 23-year old entrepreneur Olivier Baussan, L'Occitane aspires - as much today as it did back then - to celebrate the traditions of native Provence. Today, L'Occitane is a truly international company, with 753 stores and 1,500 till points in 70 countries, spanning five continents. L'Occitane encourages its staff to volunteer to work on various community-building projects the world over. From giving time to help visually-impaired children in New York to teaching new methods of soap production to co-operatives in West Africa, L'Occitane maintains that in order to produce extraordinary products, a tolerant and progressive working culture is essential. A respectful relationship with the source of their production is important; L'Occitane works extremely closely with the producers and distillers in Corsica to ethically cultivate the exquisite and rare Immortelle flower. Best selling products include the cult Shea Butter collection, enriched with 20% shea butter and blended with almonds, honey and coconut oil. Other heroes include Verbena, Almond and new range Cherry Blossom. L'Occitane's range of natural fragrance, skin care, facial products and bath essentials for men and women pamper the skin ethically and effectively.